[Webinar] Inventory Planning Methods & Tips for Optimizing Your S&OP Process Today. Inventory planning is an important component for creating the optimal inventory management process. Find out practical inventory planning methods and tips for our upcoming webinar. In the fall of 2017, we decided to host a webinar looking at the 3 Must-Have Inventory Management Software Features for Optimizing S&OP Processes. Our initial plan was to cover the three-essential software features for inventory management namely, analytics, safety stock optimization, and inventory planning in one webinar. Since we aim at making our webinars as informative as possible, we noticed the need to break up the webinar into a three-part webinar series. On February 13, 11:00am -12pm EST, we’ll host our concluding webinar session in the series. Join us as we discuss how to use inventory planning to properly calculate and project future inventory taking into consideration capacity constraints. 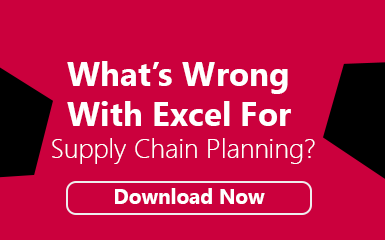 How do you determine projected inventory using Bill of Materials (BOM), Bill of Distribution, or other business constraints? How do you create a better balancing act between supply and demand? How do you project inventory for the next few months, considering tactical decisions? And finally, how do you create a better financial reconciliation process for your next S&OP meeting?